The James' who stayed in Majestic Sun 1012B said "I love being able to watch the dolphins from our balcony! " I love being able to watch the dolphins from our balcony! The Farriers stayed in Maravilla 2113 during April 2019: Awesome place! Everything you need and more. This condo and its management was fantastic. Loved every second of it. The Lindseys from Alabama stayed in Maravilla 2113 during March 2019: We had a great trip. The condo was very clean when we arrived and very comfortable. Thank you so much for sharing your home away from home with us. Dear Jeanne and Barry, We enjoyed the condo. Thank you for sharing your beach/poolside paradise with us. The place was very convenient to everything. The condo was nicely decorated and was the perfect size for our family of three. We loved being able to bring our tiny Roxy on the trip with us and being close to the pool and grassy area. Thank you again for the last minute special pricing which enabled us to do some shopping for our teenager. God Bless! The Smiths Came to visit in March of 2019: Thank you so much for allowing us to bring our furry little dog Barkley. Its hard to find such a great place for dogs to be a part of the fun! Love Love Love the view! In awe everytime I look out the doors at the beautiful Gulf. Coastline.com are the greatest! They helped with any problems we had. Will be looking to stay here again. The Gordons stayed at Maravilla 4109 for a month -- January 2019: Wonderful place -- awesome. Great condo - nice and clean - Thank You! Nice Decor! From the daughter of the parent guest: Im so sad to leave this place :-( God Bless! Well be back! Mark, who stayed at Coastal Cottage in Maravilla, said: "Plenty of room. Literally the perfect setup for groups of 6 or 8. Everything worked. We NEVER had to call maintenance. I cant say enough good things about this location and setup. Everything was exactly as described, and we hope to visit again within the next year." This is our newest offering for Spring 2019! Bring your family to BAHAMA BREEZE Maravilla 1411 for Spring Break vacation 2019! 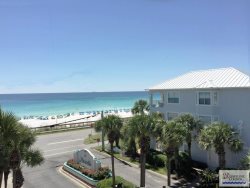 Make some memories in this beautiful spacious condo on the top floor (with elevator access) of Building #1 in popular Maravilla in Destin. Enjoy Free Beach Setups beginning on March 1 through October 31. This condo will book up fast for 2019, so book online now! "Joyce and I want you to know how absolutely exceptional Curtis is (and has been) during our stays at Maravilla 2309. He is always immediately responsive to the typical small issues that arise in a condo which gets heavy use. He is always extremely pleasant and seems genuinely interested in making our (approximate) two month stay enjoyable. Indeed, your entire operation is extremely professional." The Stokers from WI stayed with us in Maravilla 2309 in March & April 2018. "It was an great experience , easy to follow the info provided. The condo was great with a great view and decorated very nice. It was very relaxing and could have stayed another week lol. We really enjoyed our time there and hope we can come again sometime." The owners were very easy to work with, very nice. Answered all questions that I had in a timely matter. This is a beautiful place, enjoyed it very much, the view was beautiful, it was very close to everything, restaurants, and shopping.The property mgr. met us at the door upon arrival, very nice, assured us if we needed anything at all to call him. Very professional. "My experience with Coastline Condos has been great. This is my second year coming and I would definitely recommend it to everyone. Is everything you can expect on a short or long vacation trip." "We enjoyed our stay at Maravilla. It was the perfect 1st vacation for our 1 year old Yorkie. The ground floor was wonderful for potty breaks and easy access to pool and ocean." We had a very good time here at the beach in #2212. The condo had everything we needed. It was clean and nicely decorated. This was our 3rd year to visit and hope to be back next summer! Jackie had this to say about working with Coastline Condos, "Excellent - Perfect - Awesome! Our condo was beautiful with an awesome view of the beach! It was such a great vacation"
Great place to stay and convenient to everything! Great beach view! Everything was spot on. We had a great time! The Elks family, had this to say about their stay at Vacation Villa in Woodland Shores: "Thank you so much for letting us vacation in your beautiful condo! We were very comfortable here. Your place was very clean and beautifully decorated. We also really enjoyed the community. The people who live here welcomed us warmly. We would love to make this a future vacation destination!" Beautiful view! We couldnt have asked for a better location. The condo was very clean and perfect for our getaway. It was nice having the chairs set up on the beach for us everyday as well. My wife and I, want to thank Robin and Curtis for going above and beyond to help us out with the internet problem. You have been a big help to me since day one, always sweet and understanding. Thank you! I couldnt ask for a better Fathers Day. Justin, who stayed at Gulfside Getaway in Woodland Shores, said this: "Great place for a family vacation. Clean, spacious, and very close to all the action."